On Dec. 3, Mesa County Commissioners honored Dave Norman for his 44 years of commitment and dedicated service to the residents of Mesa County. From left to right: Commissioner Scott McInnis, Commissioner John Justman, Dave Norman, Adult Services Division Director Grant Jackson, and Commissioner Rose Pugliese. Read more at http://blog.mesacounty.us/2018/12/county-honors-dave-norman-for-44-years.html. Mesa County Commissioners declare Dec. 15 as Bill of Rights Day in Mesa County and present the proclamation to Members of Sons of the American Revolution in public hearing, Monday, Dec. 3. Pictured: Garry Brewer, left, and Gary Parrott. On December 15, 1791, the founding fathers of the United States of America approved a document that contained amendments to the Constitution that would become the foundation of the freedoms, privileges, and rights we enjoy today. The first ten amendments of the Constitution of the United States of America are what we know as The Bill of Rights. The Board of Mesa County Commissioners proclaimed Dec. 5 as Grand Valley Gives Day in Mesa County and invited everyone to donate to their favorite local non-profit organizations. The Grand Valley Gives Collaboration was formed in 2012 on the Western Slope to increase awareness of giving back to the local community as part of the statewide movement of Colorado Gives Day. Pictured: members of local non-profit representatives accept the proclamation during public hearing. Jackie Campbell trains Mesa County Clerk and Recorder Tina Peters, right, how to take minutes for public hearings on her first day in office. Information Technology Support Specialist Paul Mitts is known for his willingness to help, sense of humor and his love for Hawaiian shirts. Yes, it is freezing outside, so to keep warm Paul wears a vest. It's always a good day to wear a Hawaiian shirt. 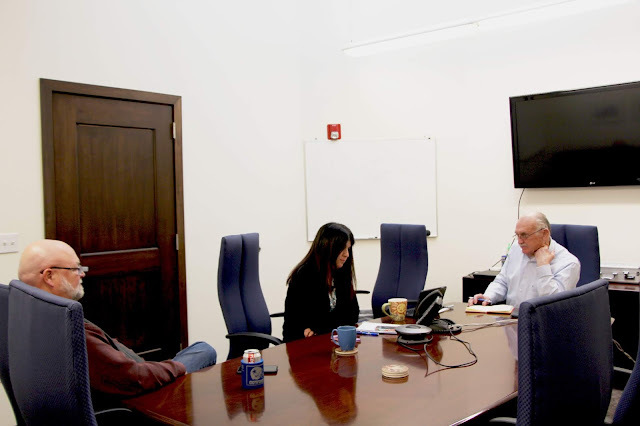 Mesa County Commissioners Rose Pugliese and John Justman, right, along with County Administrator Frank Whidden participate in a conference call with Secretary Ryan Zinke and the White House Intergovernmental Affairs Committee to discuss information on the proposed relocation of the Bureau of Land Management's headquarters. 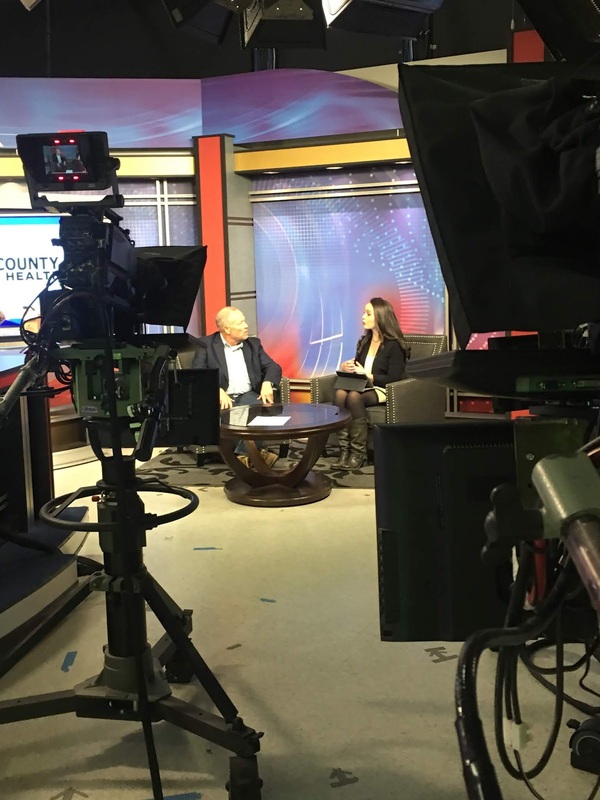 MCPH Executive Director Jeff Kuhr spoke with KREX Anchor Colette Bordelone about the 2GO grant we received to assist with the Mesa County Child Care 8,000 initiative! Mesa County Clerk and Recorder Tina Peters and Douglas County Deputy of Motor Vehicles Sheri Davis spend time on a conference call learning about the new Colorado DRIVES system. The Nurse-Family Partnership team celebrated the holidays together, this week! 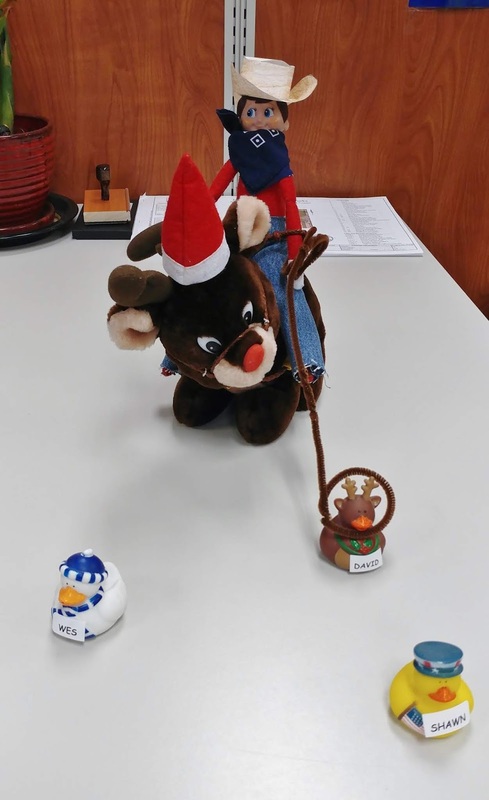 Thanks to Pam Hawkins' creativity, here is a visual of how The Elf on the Shelf is helping Engineering's Construction Group Manager Laura Page, keep her team rounded up. A friendly snowman welcomes all county personnel to the Mesa Couty Employees Association's (MCEA) Winter Hearth at Fairgrounds. And, wait, is that Santa doing pull-ups? Hmm. MCEA hosted a Winter Hearth celebration alongside the Board of County Commissioners. Personnel received a mug with a sweet little something inside as a token of appreciation. MCEA Members (pictured here left to right): Rene Romero, Amy Joy, Heidi Belatti, Lisa Petty, Donna Redd, and Lisa Snyder. Thank you, MCEA, for putting a wonderful winter celebration for all employees! The Mission of the MCEA is to create an environment that values, encourages and supports employee engagement and promotes a united organization by developing internal programs and events for Mesa County employees. Pinecone table favors or just one of the lovely details the MCEA so carefully chose to make the Winter Hearth a cozy and welcoming event. Fairgrounds Crew Manager Ryan Sears "Puppy" helps set up for live music at the Winter Hearth. All the finishing touches are done, and after lots of hard work and dedication to make the Winter Hearth a joyful event, the MCEA is ready to host. Looks like MCEA President Heidi Belatti is ready for a nap after countless hours of gift assembling and decorations. It's cold outside, and sitting by the fire and roasting s'mores is the perfect thing to do. MCEA had a variety of hot beverages, warm cobblers and a "build your own designer" s'mores bar. Puppy Sears, left, and Commissioner John Justman roast their marshmallows to perfection. Heidi Belatti and Amy Joy check-in employees at the event to make sure they receive their gift. Local country music singer, Morgan Crouse, performed holiday songs during the Winter Hearth. Crouse was recently named Female Entertainer of the Year by the Colorado Country Music Association. Mesa County Department of Human Services personnel pause for a picture to show off their gifts. Employees had a choice of warm peach or blueberry cobblers (or both), yum! County elected officials and personnel attend the Winter Hearth hosted by the MCEA. From left: Kira Goodwin, Shelley Vehik, Pat Steinkirchner, Sheila Reiner and Scott Mcinnis. Commissioner Scott McInnis and Paul Mitts enjoy conversation at the employee winter event. Employees from all county agencies stopped by the Winter Hearth for a hot beverage (coffee, chai or hot chocolate), sweet treat and a surprise gift. Mesa County Commissioner Scott McInnis enjoys catching up with employees at Winter Hearth event. Human Resources Generalist Kira Goodwin (left) and Human Resources Manager Brenda Moore. MCEA Communications Strategist Amy Joy offers DHS Accounting Technician Dalys Otberg a gluten-free treat option at the employee event. Fiscal Accountant Sara Tourney builds a s'more and gets sticky fingers. Roasted marshmallow problems. Mesa County Surveyor Patrick Green (right) sits by the fire and watches as CJSD Case Manager Dave Wetherald eats his s'more. Thank you, Dave, for posing for the picture! Road and Bridge crew members roast marshmallows over the fire. Mesa County Commissioner Rose Pugliese thanks the MCEA for putting on such a wonderful event for all county employees. Elections personnel stopped by for some yummy sweets. From left to right: Brian Williams, Lily Thorpe, Tim Long and Becky White. Commissioner John Justman chats with Mesa County Sheriff's Office employees. Regulatory Programs Manager Carrie Gudorf (left) and Public Works Construction Group Manager Laura Page. Public Work's Engineering team sits by the fire. Fairgrounds personnel Stacy Pinnt (left) and Linda Robinson enjoy hot chocolate. MCPH staff members Charity Weir and Sarah Robinson. Business Systems Analyst Valerie Rutter, Public Information Officer Stephanie Reecy and Charity Weir with Public Health bond over curly hair. Administrator Frank Whidden (left), Commissioner Scott McInnis and Road Supervisor Rudy Bevan pause for a picture at MCEA's Winter Hearth event. MCPH staff members enjoy good conversation and sweet treats. Left to right: Chelsea Stacy, Diana Williams, Andy Tyler, Katie Nelson, Sara Rinaldo, Sarah Schultz, Regina Clark. Commissioner Rose Pugliese makes s'mores alongside Kelsey Fife (left), Shane Chatfield, and Troy Ward. Today, Friday (Dec. 7) is Mesa County Treasurer Janice Rich's last day in office. In honor of her public service, her staff made an album for her. Risk Administrator Jean Boothe (right) and HR Generalist Cindy Barnett present Mesa County Treasurer Janice Rich with a going away gift. Staff had a treasure map cake baked from Janice's going away party. For the last eight years, Mesa County Treasurer Janice Rich has managed all the county's (treasures) funds. 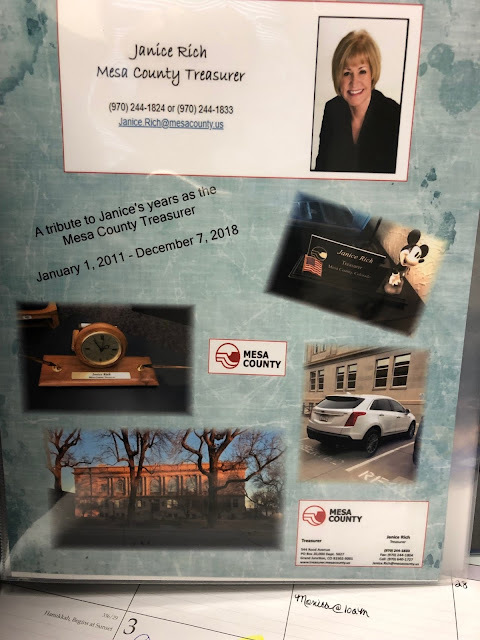 Senior Support Specialist Eric Farslow writes a farewell message to Mesa County Treasurer Janice Rich, who will soon start her new role as Colorado House Representative for District 55. Two Colorado Representatives: Mesa County Treasurer Janice Rich (newly elected Colorado House Representative for District 55) and Mesa County Commissioner Scott McInnis, a former Colorado Representative. County Administrator Frank Whidden and Commissioner John Justman sign Janice Rich's farewell card. Many employees and elected officials stopped by to wish Janice Rich farewell at a surprise celebration hosted by her staff Thursday afternoon. Mesa County Treasurer Janice Rich and Accounting Specialist Christine Horner. Mesa County Treasurer-elect Sheila Reiner and Mesa County Treasurer Janice Rich. This morning, Sheila Reiner was sworn in as the Mesa County Treasurer effective at 5 p.m. today. Congratulations, Sheila! It's official, Mesa County Treasurer Sheila was sworn into office by 21st Judicial District Chief Judge Flynn Friday morning. Treasurer Reiner is assuming her responsibilities a little under a month early.